Choose from a complete range of options, styles, materials and features to create the perfect custom blinds and shades for your home. 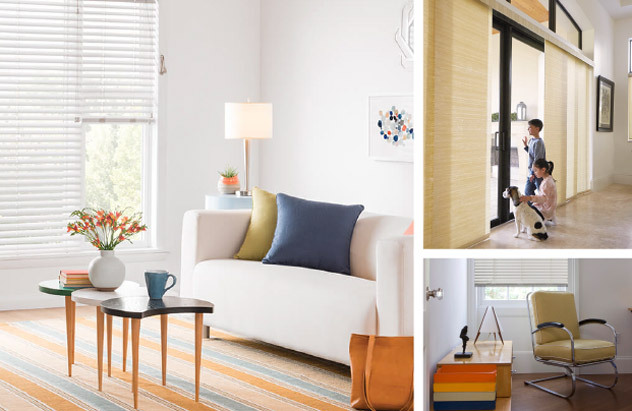 Cellular Shades are a stylish way to boost your home's efficiency, keeping you warm in the winter and cool in the summer, and saving you money on your monthly bills. Shop our collection of Custom Wood Blinds. Give your home a touch of classic style with these durable and timeless blinds, well-suited for any room of the house and easily customized for your aesthetic. Sheer Shades give your home a sophisticated style with lightweight fabric vanes that louver between sheer fabric, while protecting your furniture from harmful UV rays. These economical blinds resist scratches and stains and repel dust. They offer privacy and light control and are available in many colors. Shop our collection of Custom Solar Shades. These classically stylish shades protect against harsh sunlight and glare and can be customized to make a bold statement or complement your existing decor. Shop our entire selection of faux wood and vinyl shutters. At Lowe's Custom Blinds and Shades Store we have something for every room and home. Banded Shades give your home a sophisticated style with lightweight fabric vanes that louver between sheer fabric, while protecting your furniture from harmful UV rays. Shop our collection of Custom Sliding Panels. Looking for a large-scale shading solution? These are just what you need. An alternative to traditional vertical blinds, Sliding Panels make a stunning statement in any room. Shop our collection of Custom Sheer Verticals. These stylish vertical shades allow you complete control of sunlight in any room. They are sophisticated and versatile, ready to be customized. Lowe's has the perfect solution for controlling the amount of light entering through your skylights. Shop these custom window shades which have the correct mounting hardware to meet your needs. Since 1914, Levolor has led the home décor industry with high-quality innovation and brilliant design, helping consumers turn houses into homes. Levolor continues to pioneer customized window treatments with thousands of custom options for you to choose from, including fabric, texture and color. Levolor custom window treatments can transform your home for many years to come, delivering products that are high quality, customizable and timeless.